Of this I am convinced: there are an infinite number of ways to be a wonderful mother. There's no secret recipe or way that you need to adapt your personality. Your children need all the you-ness you've got. We mommas can be hard on ourselves. We can focus on what needs to be done more than the goodness that is. And Mother's Day is a fabulous time for us to breathe, to step back, and to bask in the joy that is each of us (remember that?). With that in mind, with you in mind, here are five gifts to give yourself for the special day. Mothering is loud, messy, and constant. And those three aspects are amazing - when taken in good doses. Give yourself time away (even if it's 10 minutes with music) to inhale deeply all that awaits you and to exhale all that has been. Some of us love the stillness of silence and other would be calmer with our favorite tunes blasting. Whatever gives you a break, take it. Children can physically wear you out. Mother's Day is the right time to go for a long walk, a good run, an extended massage, a magical bath. Reward your body for all the effort it goes through in the everyday experience of motherhood. You give of yourself and sometimes (only sometimes) you make time to be good, really good to yourself. Look at yourself with fresh eyes! Try out some new colors, a different hairstyle, a red lipstick. Granted, these changes are only surface level, but sometimes actually seeing yourself look different allows you to free up some of those preconceived ideas of who you are. I usually want to spend happy time with my kids on Mother's Day, but tantrums, activity schedules, lack of sleep, and a handful of other things can make the day feel like it's out to get me, rather than celebrate me. For your Mother's Day, you may or may not choose to be with your children. Regardless of this, give yourself the time to remember wonderful moments in the lives of each of your children. Imagine the scenes again that brought easy laughter to you and your children. And reflect on your positive role in their lives. Time to fill up your bucket. Are you a reader? Love to journal? A big movie buff? Being a great mother means you make time to develop you. Children need strong role models, right? Show them that learning and using your God-given talents is important to you, too. And get out the oil paints. Or scrapbook supplies. Or leotards. Give yourself some extra presents this year. You deserve it, momma. DIY Bunny Pom Pom Garland. Quick craft for Easter, to do with or without the kids! Hippity, hoppity Easter's on its way. Yesterday was our first real taste of spring with temperatures reaching into the 70s. Glorious. And I have spring fever. 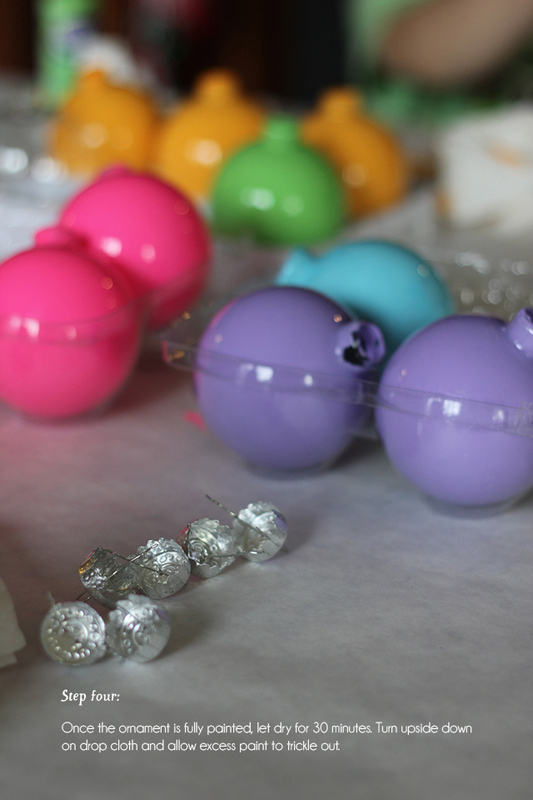 Bring on the bunny crafts! This week is packed with the first posts of spring - super easy ways to take your space into the next holiday season. White paper, the medium of my childhood, is full of so much potential! I've used it for crafts that I love like our current color blocked wreath and our daffodil wreath (that I hang all year in our guest room), and now I'm back to it with Easter bunnies. Pom poms make the cutest bunny tails. Make a bunny garland for Easter to add to your mantle or holiday celebration! To make the string of bunnies, I used our roll of white paper (from IKEA) so that I could extend the length to as long as I wanted. Fold the paper back and forth, accordion-style and trace out the half of your bunny. If you want to use the same pattern, you can download my template here. Add a bunny garland to a special Easter gift! Who needs ribbon? Unfold and flatten the chain of bunnies. Add on pom poms with glue. These garlands make a colorful addition to any and every space! And we love how they look as a present topper to a special Easter present. Folded paper and some pom poms! Peter Cottontail made modern. The Bunny Pom Pom Garlands could make a great starting line for your eager Easter egg hunt participants. Or make them extra small and transform them into a spring cake topper! Cut out just one to finish off a cupcake. Bunnies are the new paper dolls! 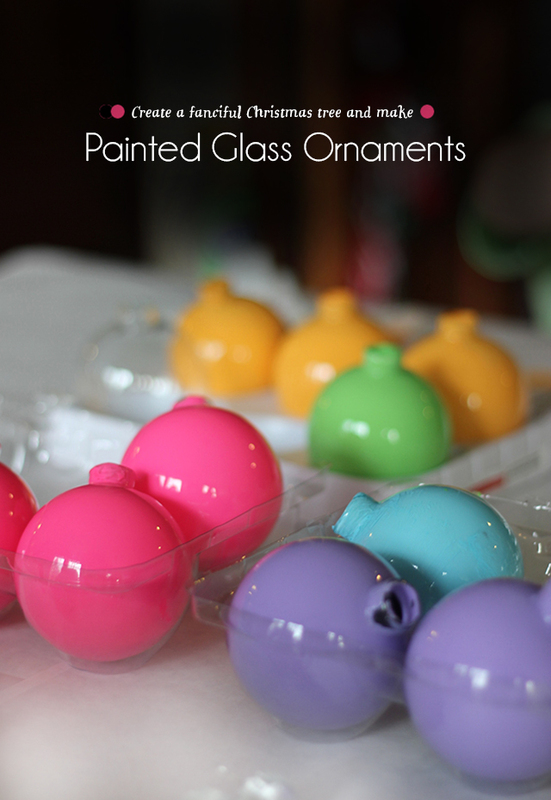 An easy way to bring the Easter season to your home. And the pom poms!! If a leprechaun visits your house on St. Patrick's Day, here are 17 silly tricks he might leave in his path! For the last several years, we've had a peculiar visitor to our house on the eve of St. Patrick's Day. A tiny leprechaun pranks us with his mischief but always leaves a few treats behind for good luck. As a young mom, I knew that we'd have visits from Santa and the Easter Bunny and the Tooth Fairy. But I was surprised when my kindergartener's classroom was turned upside down from a leprechaun! She had worked with her classmates to create traps from recycled materials to catch the little guy. They came up empty handed. 1. Turning the toilet water green. This one seems to happen a lot and always brings on a bad case of the giggles. 2. Making plants and bushes bloom marshmallows. You'll see he often borrows from April Fool's Day pranks. :) Take a look at Jodi's idea over at Meaningful Mama. Leprechauns have the power to make plants and bushes bloom marshmallows... because why not? 3. Turning furniture upside down. We've seen this one on a smaller scale with dining and desk chairs but some leprechauns go big and turn over couches or shelves. 4. Leaving various objects in the shape of a shamrock. We've had all of our shoes arranged in a big clover, but also watch out for utensils, straws, crayons, and more. 5. Adding googly eyes to everything on your child's breakfast plate/bowl. This meal is really well done. 6. Sometimes leprechauns leave behind green droppings. 7. Messaging on the smallest of papers. 8. Turning the milk for cereal green. 9. Rainbows are a go-to for leprechauns. We've had some colorful fruit plates, and this jello would be perfect, too. 10. Beware, they often leave a lot of these green footprints around your house. 11. Replacing light bulbs with green bulbs so that the early morning action of turning on the lights feels totally different. 12. Writing taunting messages on chalkboards, whiteboards, or right on your floor. 13. Crafting these adorable leprechaun images with your photos and paper plates. 14. Rocking the party with a bucket of these golden nuggets that might be more like painted rocks. 15. Planting this rainbow scavenger hunt all over your house. These free and fantastic printables might make your want to do this all year round. 16. Gifting with these special golden treat boxes filled with favorite rainbow candy. 17. The best leprechauns leave behind a bit of their treasure, and we always have a share of the pot of gold hidden somewhere in our house. Chocolate gold coins for everyone! Hoping you've kissed a bit of the blarney stone this year, and you receive some of these silly pranks at your house! Happy St. Patrick's Day. Create three-dimensional four leaf clovers! An easy tutorial to give anyone a stroke of good luck. We know that a four-leaf clover is good luck. How about an entire wall full of three-dimensional, four-leaf clovers? It's a virtual stroke of good luck. Smile. I can't help it. I'm Irish. From both sides. And many St. Patrick's Days have been spent watching parades, dressed in greens, and singing O Danny Boy. So when I saw these amazing 3D hearts from Jessica, I knew I wanted to make them into shamrocks. From her fabulous heart template, I created this PDF of the various sizes of hearts that I wanted to use. I uploaded this vector file for my Cricut machine that you're welcome to use if you have a machine. Once you have a heart cut out, using the slit in the middle, fold down a small flap on each side, and glue together. I used hot glue to make sure the heavier paper stayed together, but any strong craft glue will do. In order to give the heart petals some space, I glued each petal to a small square of the same paper. Make sure that each point is equally spaced on the square for balance. And to finish it off, cut out a simple curved stem and attach it to the square behind the petals. My daughter is taking standardized tests this week, and with those comes a bit of anxiety for her. To distract her, I covered her wall in a stroke of good luck, these many golden four-leaf clovers. It was a fun surprise to let her know she's got this. Let's go create some good luck! Tired of the usual celebrations? Here's 14 ways to celebrate silly for Valentine's Day. How do I love thee? Let me count the ways. One, twoo, fhree. Valentine's Day is all about the deep and meaningful love languages as well as the sappy and silly gestures that show you care. This year we're going all in silly for Valentine's Day, and I wanted to share our fourteen favorite ideas for bringing some fun to February 14! Eat only heart-shaped foods for dinner. Here's how you create a few items in that beloved shape: fruits, bacon, veggies, and more. Wear as much red as you can. Accessories are worth two points. The winner gets red velvet cake or blood oranges (which are actually red). Write a simple poem using words that rhyme with love (above, dove, shove, of, glove) . and upendo (Swahili). Find even more here. Watch a great episode of Hart to Hart on YouTube. Draw hearts with your initials and an arrow through them on a car window or in the snow/sand. Sing every song from the soundtrack to Love Actually at the top of your lungs. Redo your worst date but make it the best experience ever. Put your phone above your head, turn up the volume really high, and play In Your Eyes. Make chains of paper hearts and string them along your bathroom mirror. Recite (or memorize!) a sonnet from Shakespeare. Toast to love in the sappiest way you can. Accents are encouraged. Try this drink or this one to celebrate. Apply the perfect shade of red lipstick and add your smack to mirrors, windows, and the cheeks of those you love. Tell me, tell me! What would you add to the list? Happy Valentine's Day, you wonderful person, you. Catch you this weekend for some of my favorite links. This week we're sharing all the easy. Yesterday's bubble messages were round one. Enter the eraser ring as round two! We gave these to C's Brownie troop, and they were a huge hit. These printable tags make ring candy or ring erasers the coolest valentine! Because easy valentines are the best kind. This is completely not a sponsored post, but, let's be real here, Target has the best finds. For $3 we found this 24-pack of glamorous and geometric rings. They are jumbo-sized, you know, just in case you have a bunch of grown-ups who might delight in a fancy eraser ring. Ahem. No doubt about it Valentine, you're a gem. Grab a hole punch, some ribbon, twine, or yarn. We've grouped a lot of tags on one page to save you paper, too! Valentine's Day was never so girly and easy peasy. Keep the love going! And have a fabulous Valentine's Day. Paper straws as easels! The perfect place for your favorite sweet message and a great place card for your Valentine celebration. I can't help it. I love all things Valentine. The burst of reds and pinks in the middle of dreary gray winter is perfect-o. Today we're going all out with striped fun and a quick, easy project made from the classic paper straw. The mini easels are fabulous for a romantic message, your child's adorable valentine, or your party's place cards! You can whip these up in ten minutes, too, so no extra stressing involved (fist bump). For each easel you need two straws, a small piece of thin wire, scissors, and a bit of glue. You have two straws. Take the first and bend it in half. Flatten the straw a bit at the fold. At the point of the fold, make a small cut that goes not even halfway through the straw. Cut the second straw in half. One piece will be used as the back leg of the easel. With the other small piece, bend it in half to use as the base for the front of the easel. Take the long, bent straw and the back leg straw and feed a small piece of wire through the leg and one of the sides. This will give you some control of how your easel stands. Trim the wires right at the bottom of the straws and curl them over the bottom edge of the straw. Stand the tripod easel. With the folded small piece. glue each end to the front of the easel so that it creates a v-shaped shelf in the front for your Valentine message! We've made a set of these for a Galentine party for my oldest. The easels have enough celebration in them to set the whole tone of love and friendship for any kind of festivity! Conversation hearts are the iconic candy of Valentine's Day, but candies themselves could use a taste boost. What if you could send sweet nothings and enjoy some chewy chocolate, too? These brownie hearts are easy and charming for an after school treat or a romantic finale to a dinner in. Pull out your heart-shaped cookie cutter, a box of brownie mix (or make from scratch if you're ready for that), and bamboo skewers. These arrow skewers are my favorite! Use a permanent marker to change their natural tone to something more heartastic for Valentine's. Valentine conversation hearts just got a lot more tasty! Turn brownies into special messages for Valentine's Day. Bake your brownies as usual and let them cool completely. Press cookie cutter into the brownies and remove onto another plate. To stencil on your message, download the svg file Be Mine and Hug Me. Cut these with your Cricut Explore or with a sharp craft knife. Sprinkle powdered sugar into the stencil and carefully press the sugar into the letters. Finally, put on your cupid wings, and push the skewers through the heart, like arrows, and present to the one you love. Looking forward to sharing another Valentine treat with you tomorrow! It's become a favorite at our house. P.S. If you're looking for an easy way for your child to bring in classroom Valentines, turn one of her or his shirts into a fun, no sew bag! We are making things happen today! The final four of the 12 Bloggers of Christmas (an annual tradition on Pars Caeli) didn't make it into the roll. I've saved these last ladies as ones to watch for 2015, and I'm highlighting some of their goals and new adventures for the new year. If you're not already following them, check out their sites for beautiful and inspirational posts. I'm so happy to have this space to appreciate all that Kim of Design Life Kids has accomplished. Earlier this year, the love of her life died, leaving she and her two beautiful daughters. Kim is a strong and creative woman, and I've been so inspired by her passion. I have no doubt that 2014 was an absolute challenge for Kim, but she's persevered and created this fresh new breathing space for her daughters and herself. She's also opened an incredible fashion, accessories, and houseward store by the same name, Design + Life + Kids. Kim's aesthetic is cool, modern, and monochromatic. 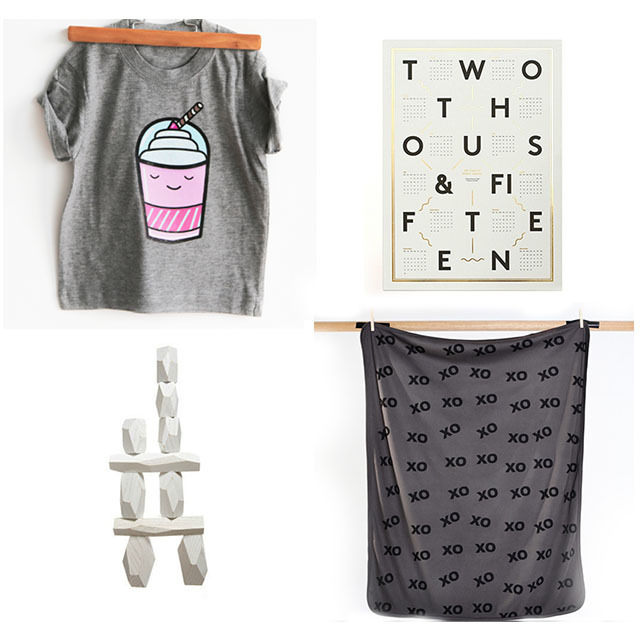 DESIGN + LIFE + KIDS has turned into shop DLK, and it's been really fun, crazy and great! It's the perfect distraction for the craziness we've been enduring this year. Next year I'm bringing on a few really beautiful luxury kid brands like Motoreta and Tutu du Monde... that I can't wait to share. 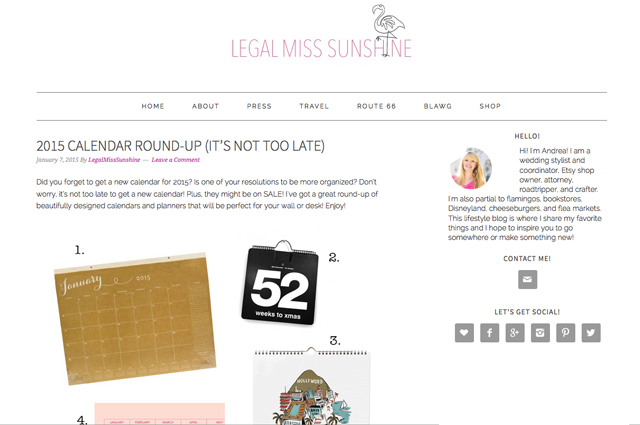 My blogger love goes out to Legal Miss Sunshine, Andrea Ament. She has an impeccable eye for design and travel. Her photos always capture the soft and subtle beauty of anything and everything around her. Her blog and obsession with all things pink is definitely one to follow. Thanks so much, Kim! I'm ecstatic to see the DLK shop taking off in 2015. If you have a baby, a child, or a hip adult in your life who needs an awesome present, click on over to DLK and become known for your great taste! I'm losing track of the days. I think I skipped a few, maybe added one. Nevertheless, welcome to the 12 Bloggers of Christmas, an annual tradition on Pars Caeli where we shine a pretty spotlight on twelve bloggers during the Christmas season. Catch up real quick on all the beauties by scrolling down. Join me every day to see if (you or) your favorites are featured! I'm chatting with Sara Moore today. Sara has an effortless style (which I'm sure takes a ton of hard work to pull off), and she writes about parenting in an honest and supportive way. She's a fabulous designer, and if you read ahead, you'll see we'll be able to get right to her goods come 2015. So happy to have her in this space! My all-time favorite family tradition is decorating Christmas cookies with my family. I've been doing it since I was a little girl and I look forward to it every year. We're all gathered around the table, laughing, eating the "broken" ones and really enjoying each others company. The logistics have gotten harder with introducing the little grandchildren to decorating and the traveling we have to do but we always make sure to fit it in! And one of my new favorite traditions my husband and I do with the kids is to look at Christmas lights. Our kids are still little enough to be in awe of every single light so it's a lot of fun! 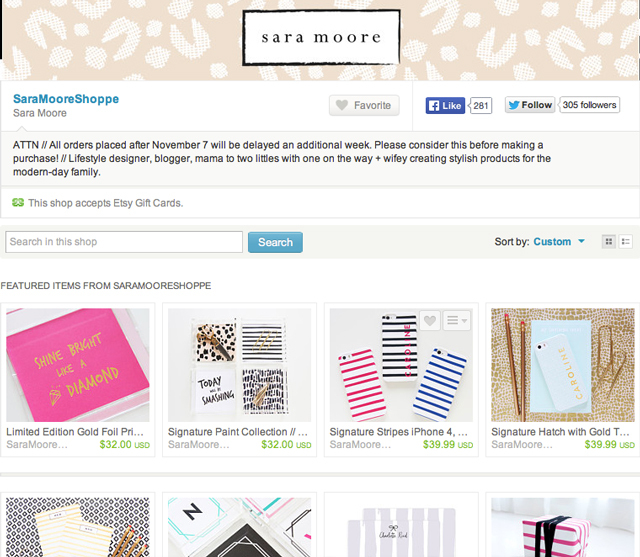 I'm adding e-commerce to the website so you'll be able to shop directly from saramoore.com. It's been a long time in the making, so I'm really excited to say 2015 is the year! I'm also contributing to a couple of other blogs in the coming year, and I'm very excited to explore new things and grow a community of wonderful people! My blog is so new that it wasn't around last Christmas and with a brand new baby, I don't have much more planned for the blog this year. BUT I will link to two Christmas posts that I love. Speaking of traditions, this one from Jenny Collier on Every Day Cheer would be a great one to start while your kids are young - a Christmas book advent. Every night the kids get to unwrap a Christmas book and enjoy it as a family by the tree. And this one from A Cup of Jo sums up a few of her and her readers holiday traditions. Elisabeth of Bella is just a doll! She has a great sense of style, is as sweet as a summer peach and her Instagram feed is so dreamy. She's pregnant with her first (a boy!) and she's just been killin' it in the maternity fashion department. She always looks amazing and has such a great attitude about the pregnancy journey. Which isn't a surprise since she touts that she firmly believes in choosing happiness - you can see that clearly through everything she does! Love Elisabeth, too!! So happy to celebrate her as well. If you want to read some interesting stories from busy mommas, be sure to check out Sara's Struggle with the Juggle series. It's one of my favorites from real life, inspiring, and talented ladies. Just a few more left!! Hope your Christmas Eve Eve is the best it can be. On the third day of Blogger Christmas, my true love sent to me all of Lulu's sweet and savory goodies! Welcome to the annual tradition on Pars Caeli where we celebrate twelve incredible bloggers and show off snippets of their creations. Unflappable in their tenacity, determination, and imagination, these artists return again and again with posts that amaze all around. Grab your coffee and get your Pin It button ready. Melissa of Lulu the Baker has dozens and dozens of incredible recipes for every occasion. She also has a plethora of holiday projects. I've been so lucky to collaborate with her on a number of projects, and I'm so excited for some of the big happenings for her in 2015 - not to mention the new baby she delivered and new house she built in 2014! I love making cookies for Santa. I feel like at this point in my life, I should pick something more mature than that, but I just love Christmas cookies. My family always makes the same 4 or 5 kinds of cookies, and it just wouldn't be Christmas without them! I have some big projects I want to blog about in 2015, mostly stuff around the new house (the basement! the garden! the mudroom! my office!). And I've been working and working and working on a book proposal, and even though I've said this in past years, 2015 is the year I'm gonna make it happen! I've actually made lots of progress on it, and I'm right on the brink of making big things happen--hooray! Chewy Gingerbread Cookies with Double Chocolate Chunks--I took everyone in my family's favorite Christmas cookie, the Molasses Crinkle, and added two kinds of chocolate chunks. And wow!! It's almost sacrilegious to say this, but they're even better than before! There are so very many bloggers that I admire. Everybody is so hardworking and generous and just lovely. Right now, I'm particularly enamored of Melanie Blodgett from You Are My Fave because she decided to take time away from blogging. I think every blogger considers stepping away from blogging when life gets overwhelming, but it is so hard to actually do it! We all worry about losing readers and losing opportunities and back-sliding, and we think that if we take a break, even if it's for a great reason like moving or having a baby or to maintain your sanity, that we'll miss out. So I'm always crazy impressed when a successful blogger takes a big, legitimate break. And Melanie is just so talented, you can't help but love her! Congratulations Melissa! Can't wait to follow along with all of the house updates over on Better Homes and Gardens, too. Tomorrow's blogger is my mochi hero. Can you guess? It is now an annual tradition on Pars Caeli to celebrate twelve incredible bloggers and show off just some of their creations. Unflappable in their tenacity, determination, and imagination, these artists return again and again with posts that amaze all around. Sit back and enjoy as we talk about Christmas traditions and projects and send out love to another creative! Today I'm delighted to shine a light over to Amy of This Heart of Mine. Amy has top notch photography to highlight the most delightful recipes and crafts. She's behind so many of the amazing DIYs you've seen on Design Mom, and I want her to shout from the rooftops all the great projects she makes because... she's just that good. I love to sit in the dark with just the tree illuminated, listening to my favorite Christmas songs (quietly) and drinking something warm. It's so peaceful. Also, I love to bake and give the baked goodies to friends. I liked this car tree ornament because I waited almost a whole year to post it. It was right after Christmas the year before when I noticed the perfect car in my son's collection and snagged it for use the following Christmas. I love it because it's so old-school, feel-good-Christmas looking. To MJ. MJ is so kind and thoughtful and excited about whatever the project. She works hard and manages to be super supportive of others. Working with her is pleasure and a treat. Plus, her Illustrator skills are enviable. So thankful for her and her friendship. Awh. Thanks, Amy. I promise I didn't pay her to say that one. Amy is making ornaments and bread and all kinds of amazing this holiday season. Pop on over to see all that This Heart of Mine creates. P.S. Tomorrow's special guest makes the season, and every day, a tasty treat! It's the most wonderful time of the year! During what is now an annual tradition on Pars Caeli, I'll be celebrating twelve incredible bloggers and sharing some of their beautiful projects. I know well how much dedication and old-fashioned hard work goes into the creation, the photography, and the promotion for it all to sync into a fabulous post. These creators come back, week after week, with high quality, fresh material that is too good not to be celebrated. I know you'll enjoy their stories and their favorite Christmas traditions, And - this year - we're spreading the love around in big heaps by throwing out some love to more of our favorite makers and writers! Keep coming back every day to see if (you or) your favorites are mentioned! First up, even better than a partridge in a pear tree, Melissa of The Sweet Escape! I've seen her work all over the web, and this year I had the pleasure of teaming up with her. I'm delighted to share her creativity with you! If you asked me 20 years ago, it would've been a very different answer but these days I really look forward to the traditional meatless feast that my aunt cooks up on Christmas eve. My family is Italian and it includes homemade cannelloni, seafood pasta and lots of other delicious dishes. I don't eat all day in anticipation and it's great to spend time with my growing extended family that I don't get to see that often. Well, it would be impossible for me not to mention my latest huge holiday project, Merry magazine. I decided to bring together 15 of my blogger pals and pool a whole magazine worth of Christmas posts together in an online magazine. It includes home decor, DIY projects, entertaining, gifting & style. My favourite project that I contributed was this marshmallow wreath that I did last year because it was such a simple idea but turned out so well, and it was featured on designer Sarah Richardson's website which was such a big deal for me as a new blogger. If you're looking for a new blogger to follow, head over to Hello Lidy. Lidy and her husband will constantly inspire you by their clean, fresh and Scandinavian inspired home & decor DIY projects. They also have an inspiring adoption story to share. I'm pretty sure they've found a way to create more hours in the day with 3 children, a beautiful house and a constant flow of original creative content. Merry Christmas to Lidy and to Melissa! So happy to have you here. Come back tomorrow to see what maker always puts a full heart into all she does! It is the season. Frenzy has set in around here. Not full-on panic, but excitement, merriment, forgetfulness, and binge eating at weird hours of the day. Deep breaths. I am excited to say that we have whipped up a handmade tree that I am all sorts of in love with. It's like Pars Caeli reincarnated in tree form. My oldest daughter and I went shopping for the supplies together and selected the palette which ended up looking a whole lot like this one here. It's the first time I've gone non-traditional, and the colors pop with the festivity of the season. 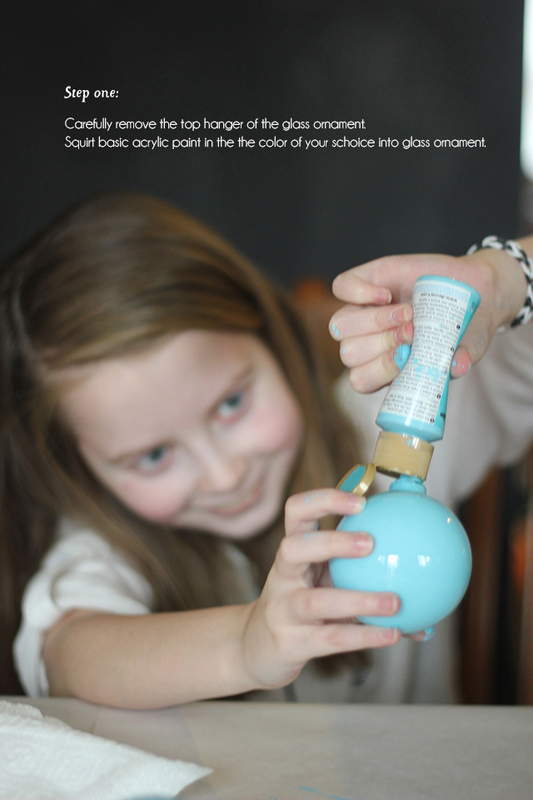 If you're looking to create a themed tree or something unique, try this easy method that is friendly to ages 3-133 as long as everyone is careful with the glass ornaments! These are magical in their final form, even better than I had hoped. And I can't wait to show them all to you on the tree, but, first, I have a few more additions to show you to our that include a few super easy projects! Check in tomorrow to see the best ever pink and orange ornaments for our fanciful tree. Also, starting later this week, a return of one of my favorite times of year! The 12 Bloggers of Christmas will be sharing with you their favorite holiday traditions and projects/recipes that have kept them excited about the holidays in the midst of frenzy! I'm delighted to have their personalities here to share with you. 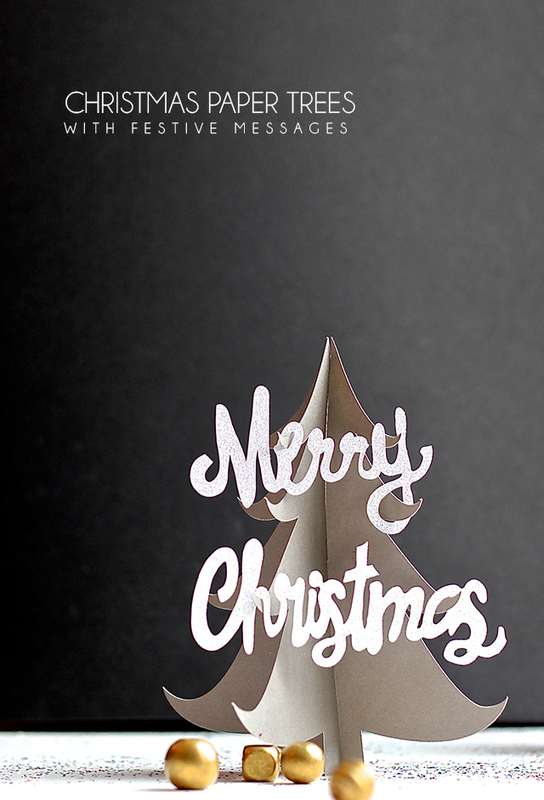 For this month's project, I created these fun message Christmas trees that shout out the joy and revelry of the season! I've been using my drawing tablet a ton (for a new, very special project yet to be revealed), and I want to experiment with creating my own text. So using my tablet, I wrote out the text and made an image of it. I wanted the words to hang on the tree like an ornament or garland might. Silver and gold and white fit in every room, every decor. Using metallic and glittery paper in cardstock weight, you have trees that can stand on their own and make super additions to the mantle and the sofa table. The Merry Christmas sign can be hung on the branches from the curves of the letters. They could also be used as table confetti around the trees or adapted to read "Merry, Merry." I am a Cricut affiliate, and I did receive a machine to make these projects. And, it's been fun. Thanks to all who have thrown their support and help along the way. I hope that you'll enter our giveaway and make along with me using the Cricut Explore. If you're a crafter, it's incredibly handy to bring dreams to reality in a really easy, efficient way. Thanksgiving awaits us in just 9 days. Our family is hosting as we typically do, and it's my absolute favorite time of year! Our festivities this year include, along with both sets of grandparents and my aunt, my nephew in college who is near. He'll bring along friends, too, who may not be able to travel home, and I'm excited to open our home to a new set of companions. We may have to break out into two tables for the first time. My children might experience the kids' table for the first time ever. Did you enjoy any holiday meals from the kids' table? My maternal grandmother often hosted our Thanksgiving, and I have memories of many years (as the youngest grandchild) spent at the table that was adjacent to the main action - the kids' table. To be fair, the kids' table had a lot of antics to be enjoyed so it wasn't a disappointment to be sitting there. What if it were a treat? Or if you're looking for ways to keep your children busy while the meal is prepared or football games are watched? I've discovered these five great projects from creators who know what they're doing that I wanted to share with you. Such great results! Hand turkeys have had their time. Let's try fan turkeys! For this you'll need some construction paper, markers, and glue. I love that it's more detail-oriented but can amuse the young child, tween, and maybe even teen. Googly eyes are always a nice addition. Check out all of the instructions over on A Girl and a Gluegun. I love this gesture of gratitude that Katie and her family did over on Lasso the Moon. On Thanksgiving day, they gave family and guests small plush hearts and thanked them (one on one) for little and big things they do for them. On one sheet they wrote down who received each heart and why. Throughout Thanksgiving Day, our family will take on the task of giving away as many hearts as possible. To give them away, we need to notice something that a person does for us, without being asked, that shows they care about us. (This can include neighbors and others, but I think we’ll just be sticking with the members of our family this year.) We give them one of our hearts, thanking them for the thing they’ve done for us, recognizing the reason why they’ve done it. And there you have a lesson in gratitude for all to enjoy. This one will delight even the youngest set. While the turkey is roasting, pull out those collected toilet paper tubes to convert them into one of a kind napkin rings. If you head over to Crafts by Amanda - warning she has a ton of amazing projects for kids and adults - you get all the details on how to make your pilgrims just right. And if napkin rings weren't sweet enough, how about these adorabel treat boxes? They'd be fun to craft in advance and use as placecards, or to leave ready to decorate for your young guests. Wouldn't these be a fabulous take home treat, along with tons of extra turkey, for kids traveling near and far? Learn all the details over at A Pumpkin and A Princess. Wishing you and your kids a fabulous Thanksgiving. How do you keep your kids happy and entertained while hosting? P.S. Need some more ideas to make this Thanksgiving the best? Check here.